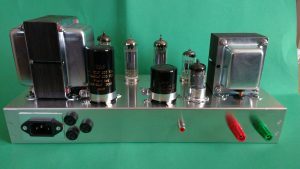 We decided to have a go at building the famous Mullard 5-10 amplifier, as a testbed for our upcoming Mullard range of transformers. When you design an output transformer, you can measure all the parameters, but the real test is in the listening! We wanted to create designs for both the mains transformer and the output transformer, initially for a mono build. We decided that both transformers should be “Stand Up” designs with metal end shells and flying leads. Although this creates a good deal more work, the end results are much more pleasing than an open frame design. Flying leads need to be anchored firmly before being soldered to the winding wire. This is somewhat more difficult than using plain tags. Due to the high voltages inherent in all valve transformers, good insulation techniques must be used for safety and longevity of the parts. The design of the prototype mains transformer was aimed at the maximum current, around 125mA. 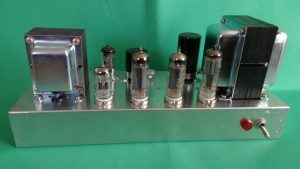 We were sure this was overkill, and one of our goals was to measure the current draw so as to be able to design a mains transformer that was fit for purpose and not too large. The prototype output transformer is designed for the distributed load configuration. It has 20% Ulatra Linear taps and matches the 6K6 anode-anode impedance with 4, 8 or 16 Ohms. Reading the Mullard book, we could have gone with the 8K primary and 43% Ultra Linear taps, but the improvement in quality is slight, and we wanted to get something working and demonstrable to do measurements against. We used a pre-made aluminium chassis, and marked out all the holes for the various components to be mounted. We used a Q-Max cutter for the smoothing capacitor holes, and the valves. This way is simpler and neater than attempting to drill and file larger holes. We assembled most of the components to the chassis, apart from the two tag strips through the middle. First to be wired up was the mains transformer. The prototype had our standard European taps: +10, 0, 220 and 240V. As we are in the UK, we only required the 240V tap, the rest were bought out to some tag strips we had mounted beneath the mains transformer for this purpose. I messed up a little, by making too many holes for the fuses: We only needed two, but ended up with three. I decided to use one more fuse to fill the hole. So we have two fuses in the mains, live and neutral, and one for the HT. 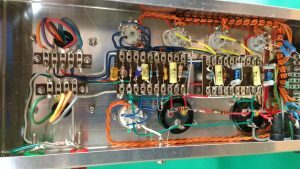 We bought the 6.3V main heater wiring out to a tag strip, as did we the HT winding, close to the rectifier valve as in the Mullard book. 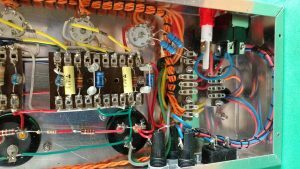 Having powered it up, and tested the open circuit voltages, we plugged the EZ81 rectifier in. 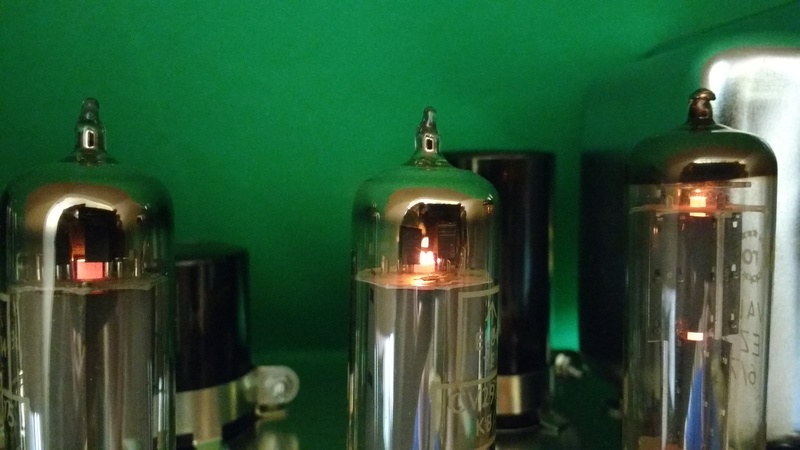 Upon powering up again, the rectifier glowed nicely. We wired up all the heaters next, using 0.7mm solid PVC insulated wire. We twisted pairs together in a tight twist, and bought each valve back to the tag strip under the transformer. The heater pairs were formed into a loom, and laced together using lacing cord to make a neat tight loom. Valve V1 had its heater wires along the opposite wall. The moment of truth, plug in all the valves, and watch them glow! Next up was to get some HT out of the power supply. 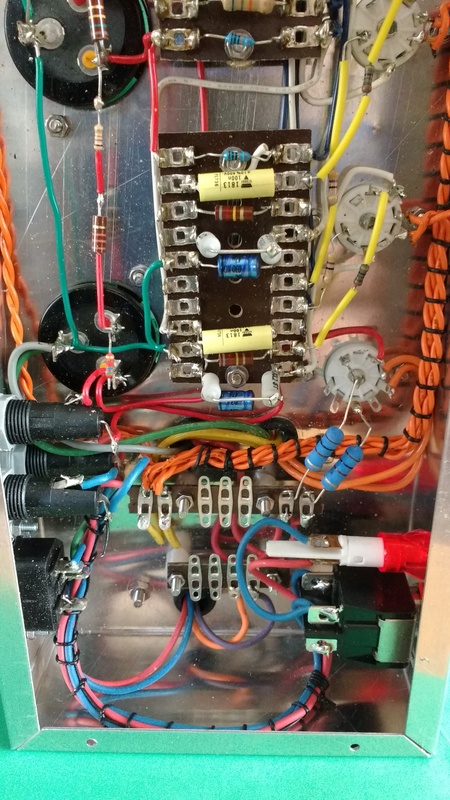 So we wired up the smoothing 50uF + 50uF caps, and the 8uF + 8uF capacitors, and measured the unloaded DC voltage. All as expected, these voltages were much greater than the figures in the Mullard book for loaded DC. Next come stuffing the two centre tag strips with the resistors and capacitors. Just following the layout in the book proved to provide an easy experience. Much better than trying to figure out component placement by hand! 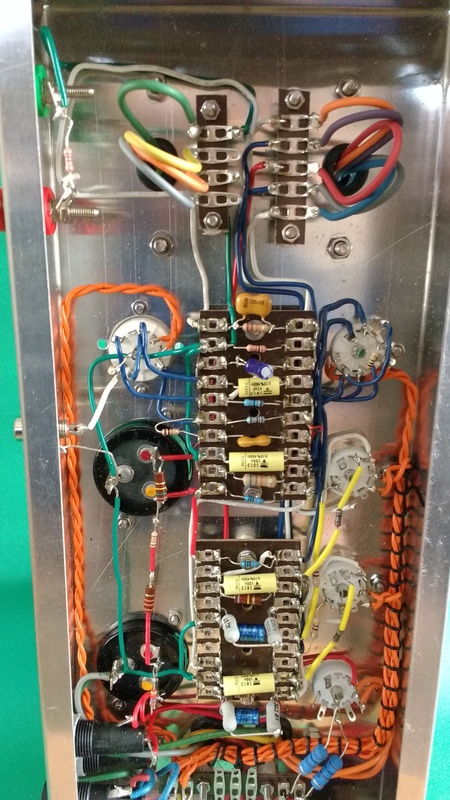 As this is a test amplifier, and we will need to add and remove output transformers, we mounted another set of tag strips under this transformer, and wired the flying leads to them. A view of the rear of the completed amplifier. Hello, Could you indicate the supplier of the large chassis mounted electrolytics? We have been thinking about chassis’s and will hope to put something up in a few months. 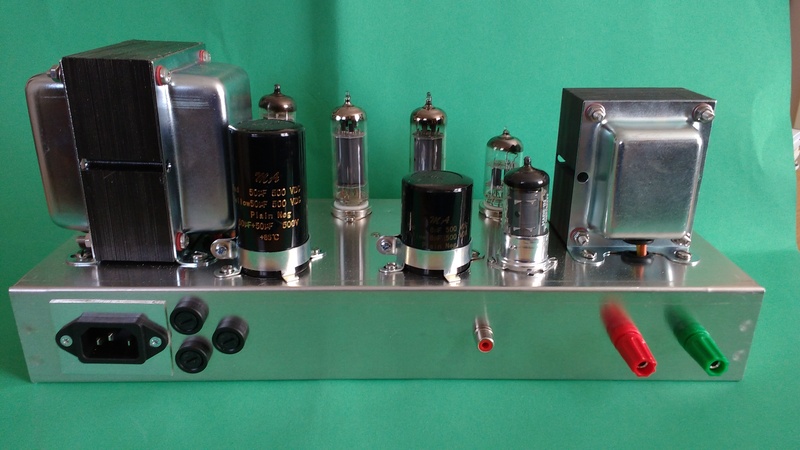 The next big thing for us is the Mullard 5-20 magnetics and stereo mains transformers. Did you make a components list of available components to replace the old components in the book? Including your transformers obviously! I am in a 100 VAC country, you wouldn’t happen to know of a suitable mains transformer, or make one?